Discussion in 'Made with GameMaker' started by sirbranedamuj, Jan 25, 2019. Hi all, I'm one half of the dev team for TripTrip. We released back in August, but I'm just now realizing that it might be fun to share our story here! TripTrip is a challenging autorunner with color-matching and platforming mixed together. Stay on track, dodge walls, and weather hazardous conditions - all while matching The Ball's color to the floor! Master switching between the four colors through more than 8 worlds of hand-crafted levels and intense boss battles! TripTrip has had quite a history. My co-developer, the creator of the game, is a composer and long ago composed a series of tracks in FamiTracker. 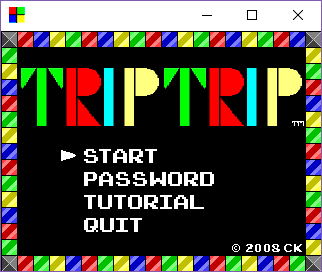 He liked them enough that he wanted to make a game to go along with them, and we got the very first iteration of TripTrip - more than 10 years ago on GameMaker 6...or 7! I don't remember which one specifically now. Years later, while taking classes together at university, I offered to help finish the game and release it. It took a while, after one or two false starts in trying to rewrite it and with an incredible amount of procrastination... Over the following years, as a start/stop hobby project, we ported the code over to GM8, then 8.1, then GMS 1.4, added in remaining content, fixed up the novice code that he had written in high school, and released it to Steam! The core color-matching, top-down platforming gameplay has barely changed over the years, we just added in more worlds and bosses, a more comprehensive tutorial, save files, a chaos emerald style secret token system, an unlockable boss rush mode, and a hidden "true ending". Most of the original music has carried into the final game, though all the tracks were touched up over the years. The only original track that I'm aware of that didn't make it was the original "Final Boss" theme which was redone. We're both proud of the final product and it's been wild to see this little hobby project of ours finally out there. Obviously it's tough to stand out with a game like this these days but just getting it done was a great accomplishment in our minds. We're looking forward to our next project, which is currently being brainstormed. Japster, Edwin and Never Mind like this. For god sake this game is so damn hard! So we've been told...how far have you gotten? Most people give up halfway through world 4. Don't forget about the easy difficulty! It's interesting, but why make an intro video of over 2 minutes with screenshots and sounds in the background? An intro video should be rather short and on point. I'll give this game a try though.